NFL Player Starves His Pet Dog Until It Dies! 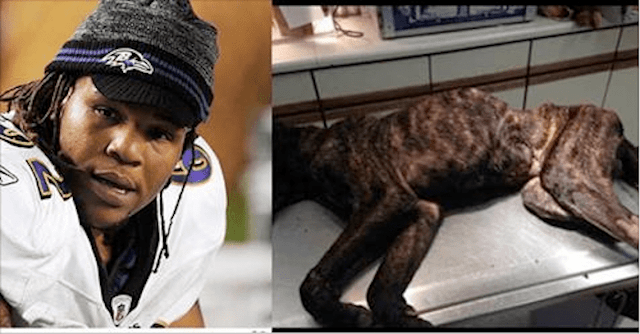 UPDATE 1: The ex-NFL player who starved his dog to death has been released from a Baltimore jail 3 months early … TMZ Sports has learned. Terrence Cody — who last played for the Baltimore Ravens — was sentenced to 9 months behind bars after pleading guilty to multiple animal cruelty charges back in March. Prosecutors said the 28-year-old didn’t feed his Canary mastiff for up to ten weeks. They also said the dog was kept in a crate that was never cleaned. According to a rep for the jail, Cody was released on September 21st. He was given 88 days credit for working and good behavior. The judge also gave him 18 months probation. During that time, he’s not allowed to own any animals. UPDATE 2: Terence Cody has been found guilty of misdemeanor charges in connection to the neglect of his pet dog, Taz. He is facing up to three years behind bars at his sentencing in January 2016. Keep signing and sharing and let’s get Cody banned from the National Football League! After months of waiting, Terrence Cody’s trial has finally commenced at the Baltimore Circuit Court. In February, the NFL player was indicted on 15 counts; the same day the accusations were brought, his team, The Baltimore Ravens, cut him loose. Terrence Cody paid $8, 000 to purchase Taz, a beautiful Canary Mastiff dog from Spain. With all the financial resources at his disposal, one might thing the dog was bound to live a happy and peaceful life in the US. It was quite the opposite. The pet was placed in a dirty cage and left there without food and water for over a month, between December 2014 and January 2015. During all this period, Cody never bothered to see how his pet was doing. When Cody finally came through and went to check on Taz, he was appalled to discover his pet was clinging to his life by a thread. The helpless animal was rushed to the hospital by Cody himself, but it was too late for him to be saved. To spare him further suffering, vets had to humanely put him down. Witnesses for prosecution include, among others, Dr. Martha Smith-Blackmore, a forensic veterinarian, who stated that the pet dog passed away after being starved for approximately four weeks. ‘It was obvious the dog had been neglected for a long period of time’ Dr. Smith-Blackmore concluded. According to her testimony, Taz should have weighed between 99 and 141 pounds; instead, he had a staggering weight of just 50 pounds when he was brought in. The vet that examined Taz first hand believed the dog had already passed away upon his arrival at the hospital. Cody’s girlfriend, Kourtney Kelley, 28, is also indicted in this case. However, her lawyer conveniently placed the blame on Terence Cody, claiming he was the only one responsible for the dog’s well being (or rather lack of it). According to Kelley’s representatives, she was not the dog’s caretaker, as she was pregnant in 8-month and was still working at her job at the time the neglect occurred. Given the nature of his actions, Terrence Cody needs to be banned from the NFL. We have seen this before in Michael Vick’s case – who is now back in the big league, playing for the Pittsburgh Steelers. The NFL needs to take swift action and impose an indefinite ban against the two-time Alabama All-American player. Such players are a disgrace to the league and have no business playing here anymore! Former Alabama defensive lineman Terrence Cody is giving back to the Hayden community — holding a youth football camp.